Popularly known as a public servant even without any political position, Daniel Razon scored another feat recently that will support his many humanitarian projects, such as those of Kamanggagawa Foundation. The UNTV executive and veteran broadcaster is an occasional singer, yet able to chalk up a Platinum Record Award for his album, Isang Araw Lang. His album sales exceeded 20,000 copies just after three months when he received his Golden Record Award with the same album upon release. The unexpected awarding took place during the thanksgiving celebration he held titled Kuya Daniel’s Up Close on November 30, 2009. The event was made for the launching of his new coffee table book Wild, but the treat in the event was the awarding of the platinum record to his album. Kuya Daniel as he is called after his TV program Good Morning Kuya, has public service as his main line of work. Aside from being UNTV executive and broadcaster, he tends to the congregation that he and his uncle Bro. Eliseo Soriano is leading: the Members of Church of God International or Ang Dating Daan (The Old Path) as locally known. Bro. Soriano is the Presiding Minister of the congregation while Kuya Daniel is Vice-Presiding Minister. Just like acting and directing, Razon sings only occasionally. His album, Isang Araw Lang, is his second commercial album. In the history of the Philippines’ music industry, only Kuya Daniel’s album was able to acquire a Gold Record Award in its first day of release as it sold more than 12, 500 on the same day in the local music scene. A factor that probably made this historical feat possible is the number of supporters of Kuya Daniel. Friends, colleagues and followers alike believe in his advocacy and his mission to carry out his numerous humanitarian projects that numerous reservations were made even before it was first released. An example of this is that the direct beneficiaries of the Isang Araw Lang album are the scholars of Free College Education in La Verdad Christian College that Kuya Daniel formally started this year. The free education project is a complete package that ensures the needs of the scholars from free books to free lunch meal. On the other hand, the Movie Writers Welfare Foundation (MWWF) is the beneficiary of the proceeds of the Up Close event. “Walk your talk,” he would often say in his speeches. His known trait of being a doer than a talker perhaps is one of the reasons his supporters are massively growing. This is evident in the continuous service he and Bro. Eli are rendering to the public. Some of these are through the Kamanggagawa Foundation’s Free Medical Check-up for poor citizens and his colleagues in the media, Free Bus Ride every morning, the Free MRT Rides for the senior citizens and the first free Transient Homes in the country for the homeless fellows. By patronizing the produce of his projects like the CD album and his independent film, friends and supporters are confident that in this way they are also able to extend their help in the charity works of Kuya Daniel. 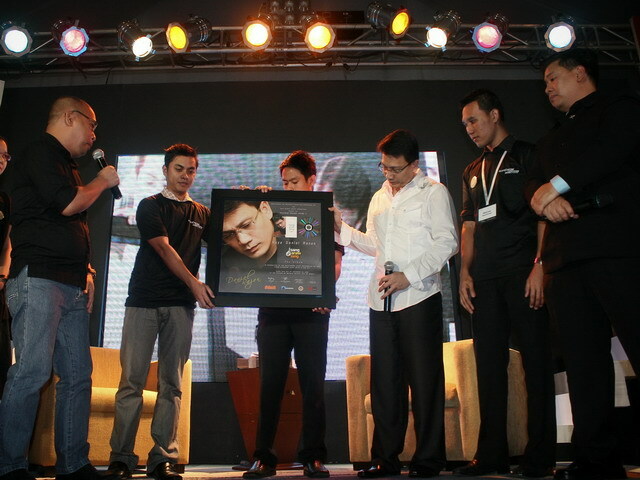 This makes Razon different from other platinum awarded singers: his drive for producing an album is of a greater cause. Juno Henares, owner of UNTV attested to this in her speech along with Jay Sonza and Citro Beltran during the Up Close event. “The best thing in you (Kuya Daniel) is that you share,” she said. Kuya Daniel’s programs such as Good Morning Kuya, Kaagapay and Munting Pangarap are continuously being aired in UNTV, and all of these are public-service oriented programs. Prior to the airing of the programs, Kuya Daniel was already doing charity works along with Bro. Eli like feeding programs in depressed areas and free medical services in different parts of the country. “(Kuya Daniel) teaches our hearts to be compassionate,” said Willie Espiritu, Razon’s colleague in media industry, during the Up Close event. He cited his personal anecdote that was influenced by Daniel’s advocacy in which Espiritu lessen his smoking and found out that he is able to save money and feed numerous hungry mouths even if it was just porridge – a clear influence of Daniel’s initiative. “I will not be able to do anything without God. Let us thank Him. To God be the glory. I don’t deserve the good and kind words they said.” This is the humble response of Kuya Daniel during the event. Part of the Up Close event was the thanksgiving celebration of Kuya Daniel as he reached his 26th year in service of the MCGI congregation.